How did you enjoy the Easter bank holiday? Did you enjoy the extra quality family time and indulge in a bit too much chocolate? I know I did! We've had such a great couple of days and we really didn't want it to end. 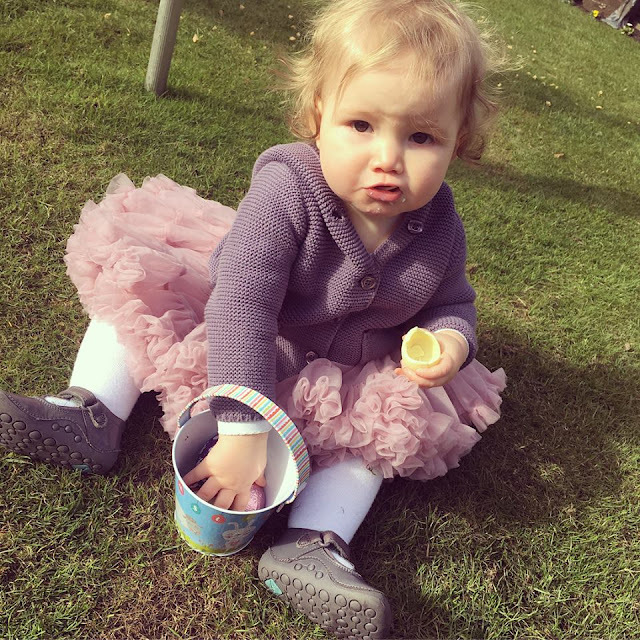 Ava was only 4 weeks old last Easter, so this years the first time she's been able to take part properly and she's been able to enjoy her first Easter egg too! On Good Friday we were invited to our Grandparents house for a little Easter family get together and party. We were treated to gourmet burgers in brioche buns and fries, followed by apple strudel and custard. It was so good and totally worth breaking the diet for! We'd also arrange to have our annual egg hunt at the party too. Although a bit earlier that usual, the sun was shining and we were surrounded by family, it was the perfect time to do it! 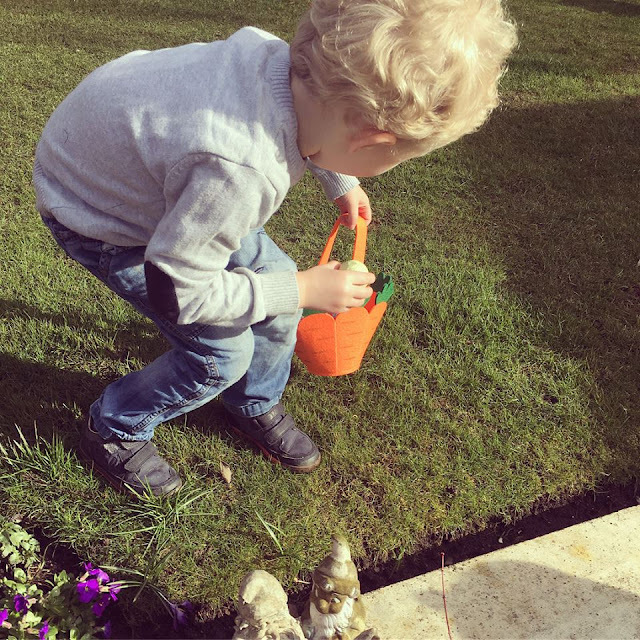 After we'd all eaten it was time for the egg hunt and I was given the task of hiding 50 little chocolate eggs all around the garden. I made sure to hide eggs in all sorts of places, in easier to find places for the younger children and eggs which were a little trickier to find for the eldest. With my nephews being older than Noah and Ava they whizzed around the garden in no time, but they understood not to grab every single one and even helped them find a couple. 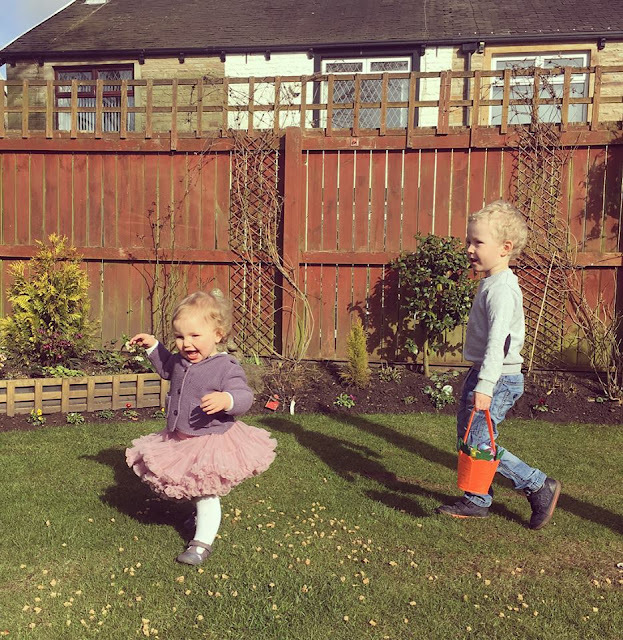 It was so endearing to watch them run around the garden together, looking for their chocolate eggs, and I was totally living for Ava's giggles as she chased after them. She was in her element having such freedom in the garden and although she's been a confident walker for a few months now she's only just getting used to walking outside. Having free run of the garden really made her day, and I think she preferred that over actually finding the eggs! We have a small front garden but it's quite uneven and there's a stone path leading through it. Seeing how much she enjoyed the free space has made me want to change our garden for her. Perhaps we'll flatten the lawn and buy a new garden furniture set. Groupon have some great deals on at the moment, it's worth keeping a look out on their website. I can just picture us now, all sat out there in Summer, having lazy days in the sun. I cannot wait for the weather to become warmer, we'll be out enjoying it every second we can! - This post contains a sponsored link. Easter was nice. As you mention nice to have some family time. Chocolate, delicious. I think Ioverdid the chocolate, now for a rest. Lovely to spend quality time with Grandparents, etc. Nice that the children got some time outdoors at Easter Time. Looks like Noah and Ava did well on the Easter Egg Hunt. Garden can be great for the children to run around and have fun. Outdoors can be great fun for little ones. Will you be Celebrating Superhero Day (04/05/2018) with the children. Could be lots of fun, dressing up as their favourite Superhero, etc. Could be held outdoors, weather permitting.